4.1 out of 5 based on 65 bloggers and 23 commenters. 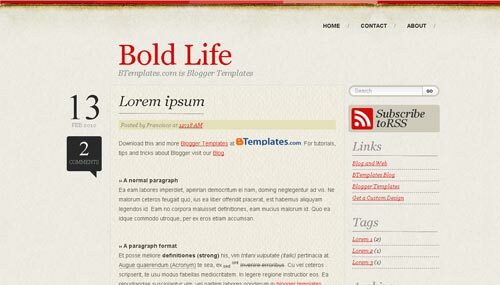 Bold Life is a free premium blogger template adapted from WordPress with 2 columns, right sidebar, rounded corners and grunge style. Excellent template for blogs about books or business. Designer: Get a Custom Design. Where’s the premium template ? i’d like to remove the search bar. how? please help!!!! how do i get rid of the GIANT days of the week in the background? Amei o template! Lindo, agradável, elegante! Muito Obrigada. I’ve integrated FB Like buttons and Google Adsense on Blogger/Bold Life with limited success, but I have a question. When I add advertisements that appear between posts, they float left and I can’t get them to center up under the post frames. I’ve tried a number of CSS cheats, and moving the physical code around a bit, but they hang left. Also, the new blogger share buttons don’t appear. They are in the “Layout” editor and the code is there, but they don’t show up on the published page. Any ideas? Thanks! I love this template and have enjoyed tweaking it a little so far! Hi, can you tell me how to get the “CONTACT” and “ABOUT” pages to appear? Maybe I have to create those pages and somehow link to them? Thanks for any help. THe template is exactly right for me! Any idea why the “page break” or “page jump” does not work in this template? @MaryWig this template was created before the jump links were standard. I’ve put it into place with success on my template. I’ll hunt around for the tutorial that I used. And yes, you need to have a contact or about me page created that you can link to with the buttons. See my blog for a working example. Good luck. I love this template and wish the author would refresh it a bit. @Claudia, sorry, I will be using the template for marywig.com but i am testing it at trubluefire.blogspot.com before I move over. @Chris, many thanks for looking for tutorial. I guess I will remove my “page jumping” before I install the template. will look at your fine example. Now i am getting rid of/cleaning up widgets. Took a look at your blog. Like the ‘another soul’ typeface. saw page jump – it seems to take a couple seconds to load. i wish it was more seamless. How do I change the background image? I tried to change the url of body.jpg with an image located in picasa but it doesn’t work. The background became white. I have messed something up and erased my home/contact/about buttons at the top…..how can I get them back? Thanx! Hey, thanks for the amazing template, I really love it and was really easy to integrate into my blog (I’m a fist timer, so it was really helpful). Just one little problem I have is the tags section, it just appears expanded… is there anything I can do for that? I love your template. I really do. But there’s one little problem though. In the labels section, it got bigger. Expanded to the bottom. How to fix this? thanks!